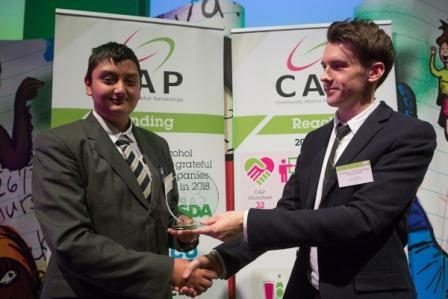 A Reading School pupil has received a National Community Alcohol Partnerships (CAP) young hero award. Beck Walker received his award at the annual CAP celebration which this year took place at the Welsh Assembly in October. 16 year old Beck represents Reading Community Alcohol Partnership (CAP) as CAP Youth Champion, helping develop initiatives and projects to tackle underage drinking. He is a pupil at The Reading School, where CAP and Berkshire Community Foundation have funded the Youth Health Champion scheme, which is run by Reading Council Officers. The course is designed to give young people the skills, knowledge and confidence to act as peer mentors, increasing awareness of healthy lifestyles and encouraging involvement in activities to promote good health. Reading CAP was set up in January 2015 as a partnership between Reading Borough Council, local police, retailers, schools and neighbourhood groups and health providers. It aims to reduce the sale of alcohol to young people, advise them on the dangers of drinking and provide alcohol-free activities through youth services and local charities. Drinking alcohol underage can result in short and long term issues impacting on health, education and young people’s future prospects. It also increases the risk of becoming involved in anti-social behaviour and crime which also affects the wider community.